The two examples we just listened to highlight a fundamental choice we make every time we get into a difficult conversation. One choice is familiar and common, the other not so much. ...and then the person you're with says or does something you find objectionable or upsetting, and a conflict emerges. 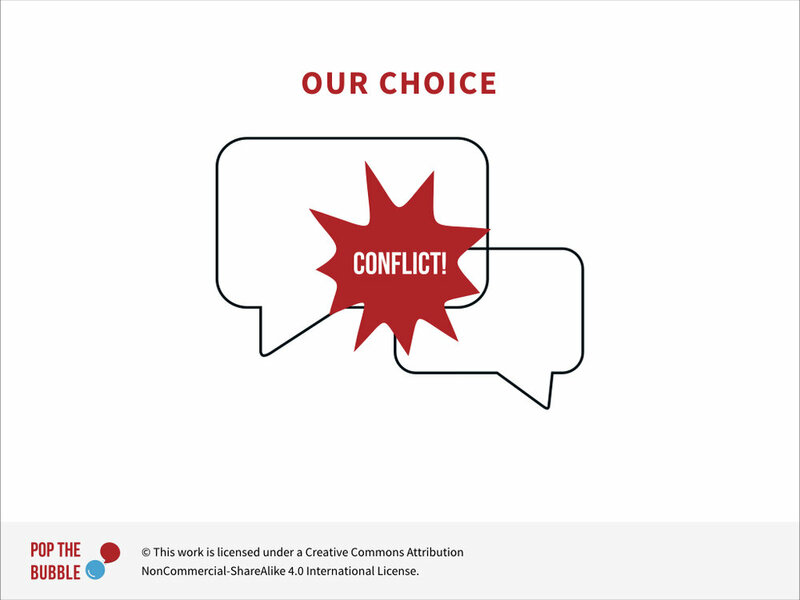 Question: What happens to you when conflicts arise? How do you feel? For many of us conflict creates discomfort and stress. It's not surprising. One thing we know about ourselves is that generally we don't like being disagreed with! Agreement feels a lot better and there's a reason for it: agreement stimulates the pleasure centers of our brain. A related reason is that, from an evolutionary perspective, having a consensual view of reality is important for survival. If we don’t see things the same way, the survival of our tribe could be in jeopardy. So it's natural for us to want to reduce the stress caused by disagreement. One common way is to get out of the stressful situation and retreat to our "tribe." This is the path the two women in the abortion conversation eventually took. They each retreated to their "side" to be with the people who affirm their perspective, their worldview. I was at our local gym exercising on a stationary bike, and there was a person on another bike next to me. We were both watching news shows on the little TVs attached to our bikes. At one point we each took off our earbuds and struck up a conversation. We were having a nice little chat, discovering some things we had in common, when at one point he looks over at the news show I'm watching and says, "CNN is SO biased!" The comment doesn't bother me. I happen to agree that CNN is biased. But when I look at what he's watching and find that it's Fox News, the hypocrisy of his comment ignites in me harsh judgement. I think to myself: "Wow, he's completely unable to see that Fox is equally biased!" In that moment there's a break in our relationship and he suddenly becomes someone I no longer wish to engage with. I say something dismissive, like "ALL the news shows are biased" and without waiting for a response, I put my earbuds back in, effectively ending the conversation. Now what we're learning, of course, is that this approach is not working for us. Retreating further into our tribes or bubbles is only making our problems worse. Stress, rather than diminishing, is increasing. As the pressure builds, both problems and relationships continue to worsen and we seem increasingly unable to respond. Fortunately we can make a different choice: the one Megan and her twitter friends made. We can decide to stay in relationship to work it out, to resolve our relationship and work together to produce solutions rather than more problems. The question is, How do we stay in relationship? What's the process? Here, for me, are the three essential conditions for staying in relationship that I take away from Megan’s story. They're a little different from her summary, but not contradictory. Instead, it’s in everyone’s interest to learn how to engage "the other" as creatively and constructively as possible; to do the hard work of finding common ground; to reduce the divide and dysfunction rather than maximize it. If we’re up for the challenge — and we need to be — it holds the promise of bringing out the best in all of us. The second condition is prioritizing the relationship over being right. In other words, if we want to build relationships across our divisions, we need to put people before our positions, connection before our convictions. The third is being able to separate our self from our story. Megan was able to see her past not as something that she was irreversibly controlled by or locked into, but as a story — a collection of attitudes and beliefs — that she had the power to examine as if from a distance, and then to make new choices based on new information, new experiences. Equally important, the people who engaged her in conversation were not threatened or repelled by her story...it did not push them away or cause them to reject her. They too separated her from her story; they saw her humanity, they saw possibility, and they engaged strategically, creatively and with heart. When we're able to make this distinction between "self" and "story," we have the power to engage creatively and constructively in any conversation. This last ingredient — being able to separate our self from our story — is the focus of the rest of this workshop. 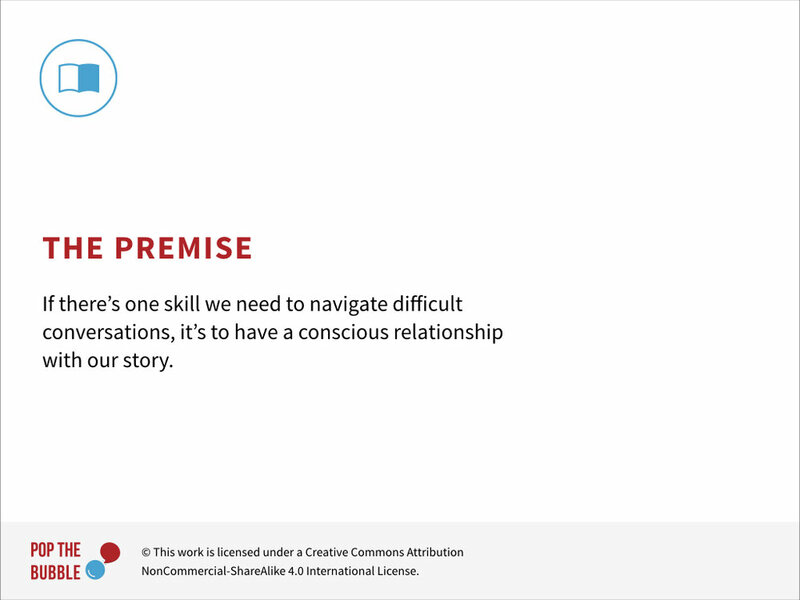 And it's build around this premise: That if there’s one skill we need to navigate difficult conversations, it’s to have a conscious relationship with our story. It also happens to be an subject where science has made significant findings that can help us gain that conscious relationship. We’ll be looking at these findings, and their implications, in a series of three explorations: The power of our story to both divide and unite us; the limits of our story — how it influences and can even determine — what we see, hear and think; and finally the power of what I am calling our "un-story" — our ability to actually access a capacity in which we're able to see and act in a manner free of our story's constraints. NOTE: For a more detailed exploration of the "three essential ingredients" for staying in relationship, check out this blog post. Before we go on, let's take a short break.